THE OZONE CATALYST V2 HAS BEEN A GREAT SUCCESS BUT THE OZONE DESIGN TEAM IS NEVER AT REST, SEARCHING TO IMPROVE ON THIS CONFIDENCE INSPIRING MODEL. THE V2 TAKES IT TO THE NEXT LEVEL - IT IS BASED FROM THE ORIGINAL DESIGN AND HAS BEEN RESHAPED AND REFINED TO ENHANCE PERFORMANCE AND ACCESSIBILITY FOR ENTRY LEVEL TO INTERMEDIATE RIDERS. The first thing you will notice is the OZONE CATALYST V2 is very stable and predictable to launch, land and fly. It has “sheet in and go” power delivery, helping you to get up and ride easily. The wide wind range and progressive de-power lets you ride in variable and gusty conditions comfortably. The updated airfoil section produces efficient power even when the kite is at the edge of the wind window, helping you to ride upwind, giving you more time to spend improving your skills! 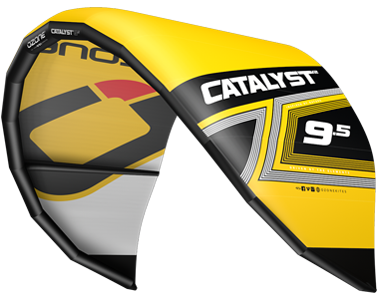 A huge smile factor comes standard on the OZONE CATALYST V2 - it is a fun and easy kite to ride that will make your progression in the sport fast, safe and enjoyable. The predictable power and lift makes first jumps a breeze with easy loft, good hang time and smooth landings. An all-new push-away quick release with an innovative one-step Click-In reload function that is incredibly intuitive.